New Tigercat equipment and an innovative business approach have reinforced Jesse Bowman’s focus on a productive, satisfying and safe work logging environment. 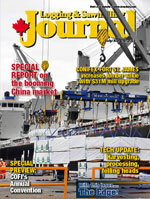 Canadian loggers sometimes have a habit of pursuing quantity of logs over quality of life. The results can be stress, a mediocre family life, and business failure. Alberta’s Jesse Bowman Logging has chosen a different path. Bowman harvests 120,000 cubic metres of primarily hardwood for Weyerhaeuser’s oriented strandboard (OSB) plant in Edson, Alberta, and softwood for their sawmill in Drayton Valley. A stump-to-dump contractor, he recently upgraded his fleet to a Tigercat 845C feller buncher equipped with a 5702 high rotation head, a Tigercat 610C skidder and a Tigercat H855C processor with a Waratah 624HD processing head. Jesse Bowman (far left) recently upgraded his logging fleet with three new pieces of Tigercat equipment. He depends on operators like Colin Colebank (right) to use the equipment as productively as possible. The processing head is traditionally a dangle head, but Waratah has designed a fixed wrist option for it. It offers better control and faster production in certain circumstances, especially for processing and decking slippery and heavy 8’ aspen or poplar logs in winter. Rounding out their fleet is a Komatsu 200 excavator with a quick attach on the boom. Bowman equipped it with a Rotobec bypass slasher grapple and this unit was used to feed logs into a stand alone Timrick tag slasher that could be operated by remote control from the loader cab to buck their hardwood logs to 8’ dimensions. This method fit their operation well when they were doing smaller volumes and prior to their recent purchase of a more expensive, purpose-built carrier and processor. They also have a Komatsu D65 EX12 dozer. Jesse’s brother, Dustin, subcontracts a John Deere 753G carrier with a Waratah 622B processing head to the business, and another brother, Clint, subcontracts his Komatsu 200 log loader, equipped with a Rotobec power clam. The company has 12 employees and logs about 10 months a year. While 31-year-old Jesse, the youngest of the brothers, says he’s eager to succeed in logging, he seeks a balance between work and time off for himself, his family, and his employees. They work five 12-hour shifts during the week and take weekends off. Outside of work, Bowman is building a new home on a parcel of land outside of town for his wife and five children. Wife, Amanda is his business partner, taking care of the office duties in addition to looking after their children. He’s in no rush to grab more volume as it becomes available, focusing instead on making his current logging operation as efficient and profitable as possible, with part of the objective being the operation of comfortable, well-designed equipment that minimizes operator fatigue. That explains his recent equipment upgrade and it has delivered immediate financial and productivity dividends. Weyerhaeuser is also doing its part to maintain a positive work environment by making the commute to work reasonable at only about 40 kilometres from town. Alberta logger Jesse Bowman is burning the same amount of fuel with his new Tigercat 610C skidder, but is able to pull 20 percent more wood per skid. Bowman requested some notable tweaks on the skidder, including bumping up the horsepower to a 6.7 litre Cummins engine with 220 horsepower. Jesse Bowman Logging has an outstanding safety record, having lost no time to employee injury for the past six years. It has the best safety record of any Weyerhaeuser contractor in Canada. It has been so successful from a production and safety standpoint, that Weyerhaeuser has asked Bowman whether he believes his business model can be duplicated. Bowman says it’s possible, but it would be difficult, as appearances are often deceiving. While he is relatively young, he calculates that there is over 100 years of experience among employees on his logging crew. He comes from a strong logging family, with his parents having met in a logging camp. He began his own logging career at the age of 16—when he wasn’t in school—working with power saws and line skidders with his father and two brothers. Bowman began the development of his business through Alberta’s Community Timber Permit (CTP) program. This is a program where smaller volumes of timber are made available on a bid basis to local residents. In addition to gaining a log volume from the CTP program, Jesse and Dustin also qualified for Weyerhaeuser’s Local Logger Opportunity Program, which is a program where the company hires local loggers to harvest some of its annual cut. They each qualified for 5,000 cubic metres, and Weyerhaeuser was so pleased with their work that they gave them the entire 10,000 cubic metres available the following year. Over the past 10 years, Jesse has been able to gradually increase his volume and the size of his equipment fleet to the point where he now works entirely for Weyerhaeuser as a stump-to-dump contractor. The terrain is generally flat to slightly rolling in their cutblocks north and south of Edson. 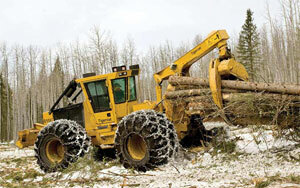 Because they operate both winter and summer, they make slight adjustments for summer logging. That’s because their operation is more susceptible to weather or terrain issues at that time of year. So they use wider tires on their skidder for better flotation, and have chosen to install 28” pads with a tri-rail undercarriage on their new feller buncher instead of 24” pads on a single rail, also for better flotation. Unlike the wood basket further west and closer to the mountains where the log diet is almost entire conifer, most cutblocks around Edson are mixed wood. Jesse Bowman Logging harvests about 75 per cent hardwood and 25 per cent softwood. Lately, it has been more softwood as Weyerhaeuser puts a priority on harvesting pine stands infected by the mountain pine beetle. Bowman estimates that about 90 per cent of the pine stands they have harvested recently have some infection in them. The company can have as many as seven sorts at roadside, with the sorting done primarily by the feller buncher and skidder operators. Depending on the cutblock, there are often roadside sorts for aspen, black poplar, tree length material, cut-to-length material, pine, spruce, birch as well as sorts for different dimensions within each species. Having a feller buncher head with 340 degree rotation capability has helped to improve sorting production. In a stand with numerous sorts, Bowman says he believes it has boosted productivity by 30 per cent. The ability to sort more efficiently also contributes to fuel savings because the tracks on the machine are moving less often. 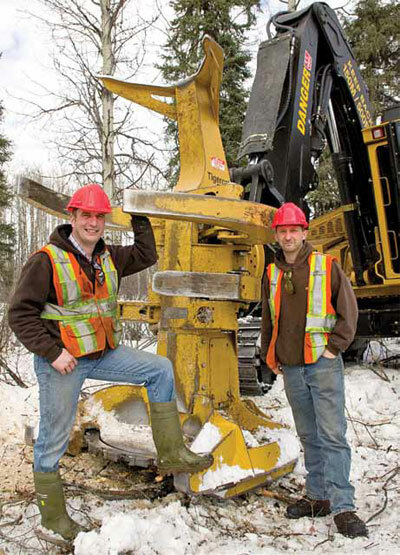 The combination of a Tigercat H855C carrier and a Waratah 624HD processing head attached to the boom with a fixed wrist has had a remarkable impact on production of cut-to-length hardwood logs for Alberta’s Jesse Bowman Logging. Bowman put considerable thought into what features he wanted in his upgraded fleet. Equipment reliability was a major concern as he put a variety of equipment brands to the test. He had experience with Tigercat in the past and was impressed with the equipment’s uptime and engineering. Fuel efficiency was also foremost in his mind, especially given the direction that fuel prices are heading at present. “I wanted to see if the Mercedes 6.4 litre engine was going to be as good as what I was being told and so far it has been,” says Bowman. “It’s at least 20 per cent more fuel efficient than the engine in our old feller buncher.” They have the same engine installed in their Tigercat H855C processor. While not as big an issue, operator comfort was also a consideration. Add in the advanced engineering and capacity of the newer Tigercat equipment such as Tigercat’s ER boom, and Bowman says that production has improved 10 to 15 per cent per shift. Unlike traditional excavator booms, the design of the ER boom allows for one smooth motion back and forth from the tree. The high rotation wrist on the felling head with its capability of rotating 340 degrees and the fixed wrist on his processor for better control are two decisions that have had an immediate positive impact on productivity. He also requested some notable tweaks on his Tigercat 610C skidder. “The specifications on the 610C typically make it a little bit small for this area,” says Bowman, “but we bumped up the horsepower to a 6.7 litre Cummins engine and 220 horsepower with a 17 square foot grapple. So with those two advances in the engineering, the wheel base is exactly the same as another popular brand out here, which puts it pretty much head to head with that larger skidder.” His previous skidder had a 5.9 litre engine with a 14 square foot grapple. Even though he is now pulling more wood, the new skidder is burning around the same amount of fuel. So far, Bowman says Tigercat dealer Wajax Industries has worked hard to live up to its promises for after-sales support, which he also appreciates. Response has been quick, and the only problems they’ve encountered so far on the equipment have been with a few hoses.